Grant Morrison and Dan Mora's Klaus was my favorite comic book story of the year. The reimagining of Santa Claus as a superhero with an origin story that was equal parts Rankin-Bass and Batman RIP is probably the platonic ideal of what I want out of entertainment, and after reading the entire first series, I really just wanted more. Now, I'm getting my Christmas wish: on December 21, Klaus returns in Klaus and the Witch of Winter, an extra-sized one-shot in which Morrison and Mora bring Santa to the modern world and go beyond his origin story for an all-new adventure. ComicsAlliance spoke to Morrison about his feelings about Santa Claus, why the series is like his personal Doctor Who, and why Santa Claus is real. Because of course Santa Claus is real. ComicsAlliance: I feel like there's a lot to talk about with the idea of Santa Claus as this memetic figure who moves in and out of mythology and pop culture and history, and I was wondering how you came to want to do your take on an origin story for him? Grant Morrison: It came about because I was thinking about what I could do that would be my own Superman, or Doctor Who, or Batman, and suddenly, I realized that no one had done the origin of Santa Claus. For me, it was just a case of wanting to take this character that everyone knows and wanting to do something new with it, and something a bit more contemporary. The idea was making Santa Claus into a superhero, which just seemed to me hadn't been done. We all know him, we all love him, we all grew up with him. Imagine making him into a superhero; he could have all kinds of adventures across decades, across history, and be a really important comic book figure. CA: What did you look at to inform what you were going to keep from the existing Santa Claus mythology, and what you wanted to get away from? GM: Honestly, I've read everything about the origin of Santa Claus and the history of this whole thing that creates the origin story, which is in the Klaus hardback collection. And then I thought of him more like Doctor Who, or Superman or Batman, that I wanted him to be available to exist in different time periods, so you could have a Santa Claus World War I story, a Santa Claus contemporary 21st century Donald Trump story, a 17th Century story. I suddenly realized that the character was so familiar, and so understandable to every child and every adult that you could tell a few types of narratives with him. It became, "Okay, we did the origin story with Dan Mora, and that worked out," and now, every year, I'd love to do a Santa Claus story with a different setting, a different time period, a completely different Santa. He's so adaptable. CA: Is there a trick to putting superheroic aspects into him? Or do you just think of him in the same way that you think of Superman? GM: Yeah, because it seems easy. To me, it was like, "Why has no-one done this?! Why has no-one considered Santa Claus as a superhero?" He has these particular conventions that design who he is, and they're very positive, very optimistic. To me, it was less Superman and more Doctor Who. Every year, they do a Doctor Who Christmas special and it's all very different, with different characters, and I thought of Klaus as that kind of character, who can appear in different genre stories. Horror stories, or fantasy stories, there's so much potential in the character to be very different. CA: I wanted to talk specifically about one of my favorite moments of the first story: That scene in the second issue where he's coming into Grimsvig, and he's basically coming in like Batman, except he's bringing in toys. CA: That was one of my favorite things I've ever read in comics. The idea of Santa coming in and infiltrating this city, fighting all these guards, but he's still doing it with giant snowballs. It's so serious, but there's an element of Christmas whimsy to it. CA: You talked about the familiar elements of Santa, and by the end of the story, he's got the sleigh, the toys, the promise to come back every year at Christmas, but there's one thing that gets away from the established imagery. He has wolves instead of reindeer. GM: Honestly, I just thought it was better. I was focusing on the shamanic, Siberian, Nordic origins for Santa Claus, and the wolves just looked cooler. Honestly, it was that: How good do they look in the drawing? And they look great in the drawing. I think of Santa's sleigh as an alien piece of technology that can change shape and become all kinds of things, so some days, it might be reindeer. 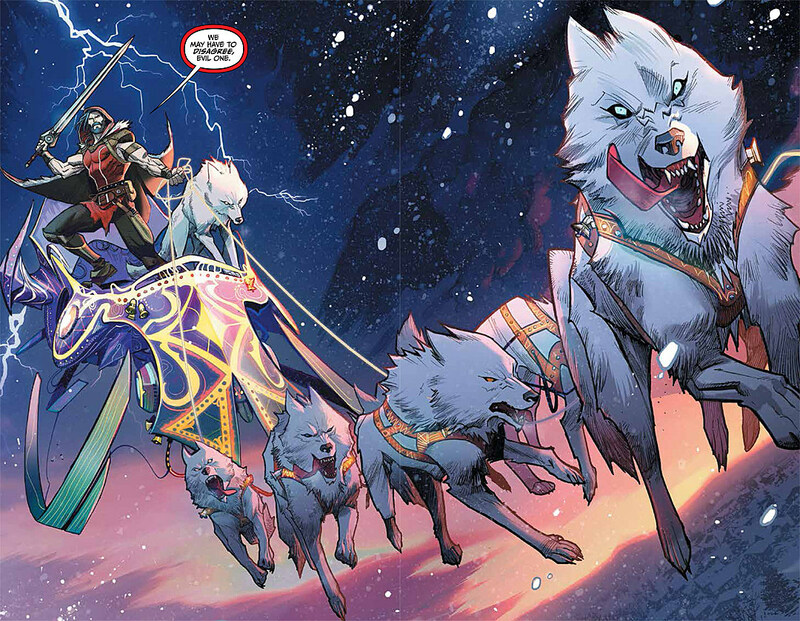 But for me, the idea of wolves pulling the sleigh was, visually, just a great image. CA: There's also an idea of him going past the Northern Lights, which might've been surprising to American readers, more than it would be to readers in the UK who grew up with Father Christmas. Did you want to bring in those kinds of regional variants? GM: There's this whole Nordic idea of where Santa came from --- it's from the North, it's from Norway and Siberia --- and the Northern Lights were a big deal in that. They're very visual and very beautiful. I've seen them once in my life, when I went to Iceland in 2002, and it's the most beautiful, alien display of laser technology I've ever seen. I wanted to involve that, and tie it into these ideas of alien abduction, or being captured by the elves that have been believed in for thousands of years, that there's something else out there. Those elves, those beings that are different from us, and can change our attitudes. I wanted to bring that in, the entire shamanic experience of what happens when you get high on drugs, or on a sense of novelty that's different. CA: I think the idea of aliens abducting you and taking you to a different place, but when you come back you're the best possible version of a person, is great. GM: When it was ancient, when it was medieval, the aliens were elves or other beings, big-eyed, black-eyed, small-mouthed, no-nosed friends that entered human existence and changed how we feel and how we react, so yeah. That was part of it, very much like Close Encounters. These beings are never explained, but clearly they changed everything about him. CA: You mentioned wanting to do stories in different time periods every year, and in Klaus and the Witch of Winter, it's in a modern-day setting. What can we expect from that story? GM: In the new one, Klaus has just come back from the moon, and he's been held captive for maybe 20, 30 years. He's come back to a contemporary world that he doesn't quite understand; he looks at something and goes "Is that weird oblong object in your hand a phone? Because when I left Earth, phones were things that only existed in one room in the house, and they looked like this." Suddenly, the phone is a ubiquitous element of the human experience, everyone has a phone, everyone's connected, everyone's tied in. So for Klaus, all of this is new. We're bringing him back in this story to a super-contemporary, modern world that he hasn't experienced. He hasn't been here for thirty years, it's all new to him. It allows the character to exist in different milieu, different states of being, and allows him to be much bigger than he was in the origin story. CA: I noticed there are scenes where he sees other versions of Santa Claus, too. GM: Yeah. The idea of Santa Claus is that he travels around the world giving people presents, but what happens when the world population grows to a point where he can't handle it anymore? There's too many kids -- way too many kids! He can't give them all presents. So we introduce these other versions of Santa Claus, the Middle Eastern version, a Russian version, a Communist version. That's his personal League of Extraordinary Gentlemen, all these different Santa Clauses forming a team. CA: I know that you famously have the story about the inception of All Star Superman, when you met the guy in costume in San Diego, and I was wondering if there was a similar moment with Santa. GM: No, honestly I wish Santa would come up and give me my heart's desire, but it hasn't come up yet. CA: Were you a kid who really loved Christmas? Because I've always been the type of person who waits for it all year long. GM: Every young kid is into Christmas, but I was a poor kid. My parents lived in Glasgow, and you could hope for a tangerine and 10p in your stocking. I never believed in it, but I always loved the idea that this is a major character that everyone can understand, and hasn't been dealt with, literally or even in that pulp fiction kind of way. It's so obvious, and it just hadn't been done. CA: There's an aspect of Santa Claus that I really like --- and I'm someone who spends a lot of time thinking about Santa --- and it's this idea that it's the One Good Lie. We all agree that we can do something nice for kids, or for each other, and not take credit for it, and say, "Oh, no, that was Santa Claus." I feel like there's a lot of similarity to the way you write about Superman, even going back to "The Last Days of Superman" and the inscription on the moon. Is there a connection there, especially to a Santa Claus who wears that red costume and has a big white dog? GM: Definitely; the idea that we as a human species are very contradictory, that we fight wars and we hate and we're full of contradiction and confusion, but at the same time we imagine these beautiful, unstoppable ideas. Superman is one of those, and Santa Claus is another one. He's aimed at kids, but it's emotional: There's someone out there who stands for this. We all know that Santa Claus isn't real. We get to a point as children where we know he's not real. But then we grow up, and get to a point where we think, well, Santa Claus is real. We've known about him all our lives. Every year, we hear about this character. What is that character? What is that power we all understand? Every generation has their own version of it, but it's real. Santa Claus doesn't have to be physically real, because he's emotionally real. I'm fascinated by that idea. Even as a teenager, I remember sitting up and thinking, "I know Santa's not real, but it's Christmas eve, and I'm hearing bells in my head. Why am I hearing bells? I know Santa Claus isn't real." And then the understanding: Of course Santa Claus is real. He's a real idea. Like Superman, like Batman, he's an idea so powerful that we can't destroy him by rationality. That's magic.